From now until 10th June 2014, The Langham, Xintiandi, Shanghai engages guests to an extra indulgent high tea with its launch of Tiffin Damiani Afternoon Tea ‘Lady in Pink’ competition. 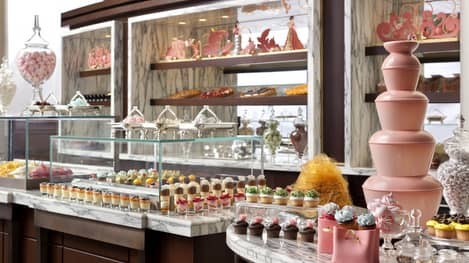 Located in the Cachet Lobby lounge on the ground floor of the hotel, every lady who dons a pink outfit and orders a Tiffin Damiani Afternoon Tea enters into the Lady in Pink Contest to go in the draw to win a spectacular prize worth RMB 200,000. The prize comprises of a one-night stay in The Langham, Xintiandi Chairman Suite and Damiani’s exclusive Butterfly collection diamond ring. 1. The female guest must come adorned in pink-themed ensemble in the most fashionable, creative or eye-catching way, and order a Tiffin Damiani Afternoon Tea set. 2. Put on the hand-made Damiani Butterfly ring chocolate piece from the Tiffin Damiani Afternoon Tea set on her finger. 3. Snap a creative picture of herself along with the Tiffin Damiani Afternoon Tea set. 4. Post the picture on the hotel’s official WeChat page. 5. Top 10 photos of the Best Dressed Ladies in Pink will be selected by early June, 2014. On 10th June 2014, which is The Langham’s 150 Years Anniversary, The Langham, Xintiandi will host an afternoon tea party with the Top 10 Best Dressed Ladies in Pink in celebration of this special day and a grand prize Lucky Draw will take place to choose the final lucky winner of the contest. The Tiffin Damiani Afternoon Tea is available at the Cachet Lobby Lounge between 2:00pm to 5:00pm daily until 10th June, 2014. Each set is priced at RMB 688 for two persons, subject to 15% service charge.